The pilgrimage included a visit to the town of Ovada, the town where St. Paul of the Cross was born. The Passionist Superior General, Fr. Ottaviano D’Egidio, C.P., was Principal Celebrant of the Mass in the room where St. Paul was born in 1694. 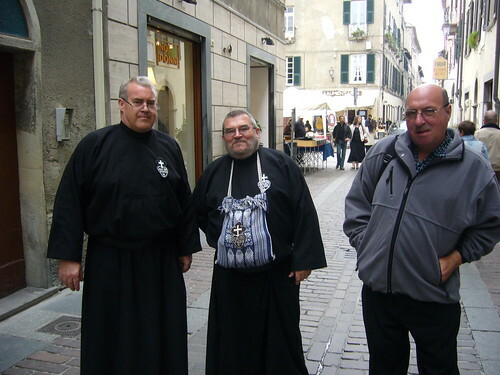 Pictured in Via San Paolo della Croce in Ovada are Fr. Timothy O’Toole, C.P., Brother Jerome Dunn, C.P., and Brother Martin Lusk, C.P. This entry was posted on 23 October, 2007 at 10:24 pm and is filed under CP. You can follow any responses to this entry through the RSS 2.0 feed. You can leave a response, or trackback from your own site.